The Large Fire Station is a Civic Building that provides Fire Protection for your Sims. Fire Stations reduce Flammability by a variable amount dependent on their funding over a variable radius which can be adjusted using the Vehicle Funding slider in the building's Query Panel. 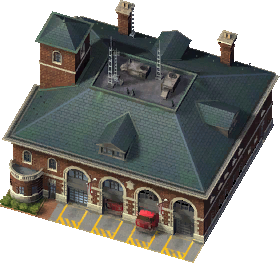 The Large Fire Station is the second most expensive and effective Firefighting solution in SimCity 4 Rush Hour/Deluxe (The most effective and expensive in the base game), with an increased monthly cost, more dispatchable Engines, a stronger Fire-deterring effect and a wider coverage area than the Small Fire Station. It is positioned above the Small Fire Station and below the Fire Department Landing Strip in Fire-fighting power and facilities. The Small Fire Station is a direct downgrade and the Fire Department Landing Strip somewhat of a sidegrade. The original name for this building was probably the 4-Engine Station House before being changed to Large Fire Station as its exemplar still contains this name. This page was last modified on 5 February 2014, at 15:01.